Fish was never my favorite food but gradually I started liking it, these days I feel like eating fish curry at least once a week. 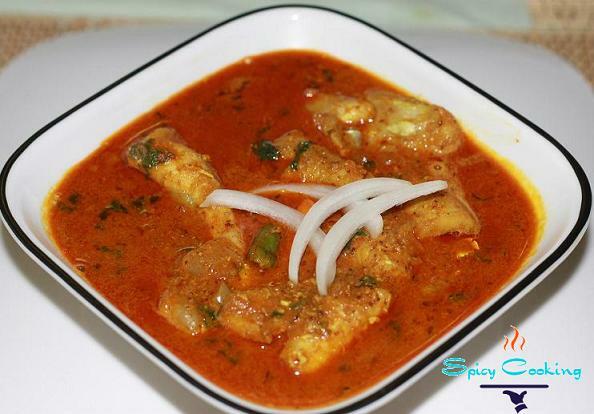 The fish curry recipe that I am sharing here is one of my favorite one. It is also very popular in Odisa and West Bengal of India. It is commonly popular as dahi mach. Different people make it in different ways but here is my way of cooking it, I hope you will like my style of preparation. The recipe is for 4-5 people. Clean the fish well, make sure to drain all the water. Add 1tsp turmeric powder and salt to taste, mix it well. In a pan add oil and fry this fish for a while till both side of the fish turns slightly brown. Do not fry too much. Now remove those fried fishes from pan and drain the excess oil. Add chopped onion to the oil and fry till it turns slightly brown. In the meantime grind cumin, mustard and garlic together and make a fine paste. Now add this paste to fried onion and fry 2-3 minutes (Remember do not fry this paste too much as mustard paste gives a bitter taste when it is over fried). Add turmeric, chilli powder and green chilli to this paste and mix it well. Add two cups of hot water to this mixture, add fried fish to the gravy. Let it boil for five to seven minutes. Now add little water to this thick yogurt and make it little thin before adding to the gravy. Mix it well and let it boil for another three-four minutes. Add salt as per your taste and you can manage the thickness of the curry as per your requirement. Now your yogurt fish is ready to serve with rice or roti. I love to eat this with rice and cucumber salad. Enjoy your fish and do not forget to leave me comment about this recipe and if you have any new fish recipe ideas feel free to share here. No matter what I eat on a day to day basis but I do thrive for this curry once a while. Thanks to you for making this curry, it looks good for sure and it was also tasty at the same time. 100% recommended... It makes me feel at home when I eat this.. Everybody try this at your home..